Brain teasing puzzle lovers will be addicted to this minimalist and unique puzzle game Ignis. Sparkle all mind twister shapes strategically in this minimalist puzzle action game. Tap on the point to ignite and watch all rectangles, hexagons, and circles burning. When one shape burns out, its sparkle spreads on the nearest shape and ignites it. If you like concentration games or challenging games, this physics puzzle game keep you enjoy for hours! Engaging games start easy and simple but get harder as you pass the levels. Ignis just like all addicting games for free begins with a level that you burn just one shape. However, after completing a couple of puzzle levels, you need to think how to burn five or six shapes only with a sparkle in this logic game. 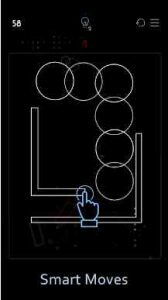 There are hundreds of logic master levels to complete and mind twister shapes, difficult mechanics, exigent lines and zigzags are waiting for you. Fuse all skillfully and have a challenge fun! Ignis is one of the best challenging and addicting free games to play when you bored. Its unique sounds, simple designs, relaxing fuse and sparkle effects and physics based mechanics can make it the best arcade game. Think strategically and tap the point you decide, then, watch the burning lines with the sparkles. Each sparkle will connect to other shapes if you can find the correct sparkle point! Unique and simple game mechanic and design let you live a different puzzle game experience. Puzzle levels getting harder and harder makes you addictive to this exciting puzzle game. Physic based levels are a great joy for the lovers of brain-teasing puzzle games. This classic logic game keep you entertained for hours! I absolutely LOVE this game! I haven’t had such strong reactions to any other game as I’ve had to this. Prior to finishing the first block, I paid a buck for add free. I thought I had finished the game. Left it for weeks. Going back, i find at least three more blocks of levels. I’m totally stoked! Best game I’ve ever played, and I’ve tried tons of them. I loved how calm and peaceful I felt after playing Ignis, and major points for not shoving ads down my throat. All in all this game is very enjoyable and gets a Five out of Five in my humble opinion. ok game so far. The only reason i am giving it a 3 not 4 is that there is no settings menu. I want to turn off the irritating vibrating. Love this. It’s the only game where I leave the music on. I would only ask for one change: it would be great if the final payoff of the burn lasted another half-second. a very great time waster. No glitches (so far) beautiful graphics. Honestly get the game its super fun! its a great game but a dont know how to turn of the weird noises in the background.